This shows the closest persons raw threat % in the tooltip on mouseover. 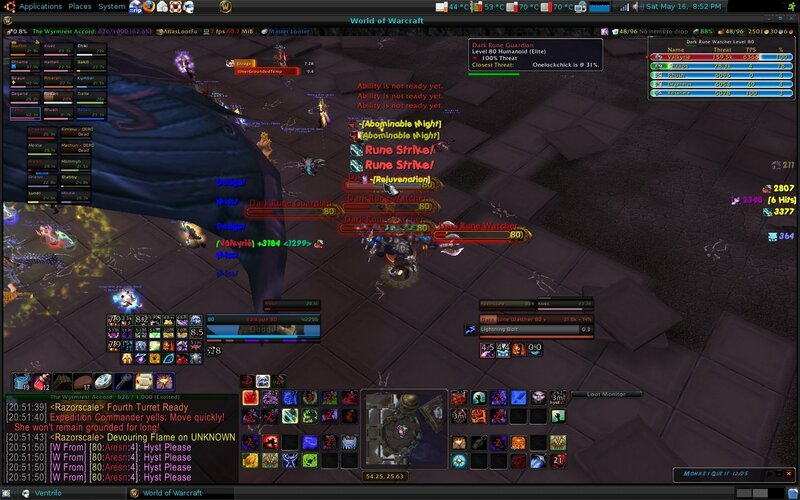 As a tank in pugs was sick of people not targeting the right mob. So created this mod so I would know which mob to concentrate on more. Pictures do a better job of explaining. Add options so people can add more party/raid members to list, probably max it out at 5. If you want something ask. Thanks to all the helpers on #wowuidev on irc.freenode.net. I have a lot of questions and you've answered them all. Especially ArrowMaster for helping me understand OnTooltipSetUnit. Thanks. I've been looking for something like this, thanks. On a side note, i really like your ui. Don't suppose you would upload it? Most of it is the same but i've changed my unit frame addon, i didn't have time to hardcode Ouf frames anymore, so have gone with shadow unit frames.bars are dominos. It's really a mess, so prolly wouldn't upload. This looks EXTREMELY useful. Thanks! It is for me, especially in pugs. I was getting help writing my mods in WoWI irc chat and someone said i should post em up, so i have. Seems some like my mods. Great addon! Unrelated question: what's the bar you have at the top of your desktop in your screenshots? And the module that shows the weather, what's that? Thanks in advance, love the addon. That's actually part of Ubuntu (linux), um when i take screenshots it takes it of the whole desktop, overrides wow's built in, instead of removing the whole bar i just post the ehole thing. THe weather thing isn't weather, the degree's are of different components in the computer, the globe thing with a computer on it, is a shortcut to the remote desktop app.